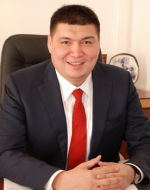 Nurlan Kussainov has a bachelor degree from Kazakh State Academy of Management and Master's degree in management from Stanford Graduate School of Business. He started his work experience in 1996 as an economist with Kazakhmys, after worked for the Strategic Planning Agency of RK and served as a Head of Strategic Planning Department for the Development Bank of Kazakhstan. Since 2002, he was the Counselor Minister of Economic Affairs and Budget Planning of the RK. He also was the Head of WTO Accession Team in Geneva, Switzerland, as representative of the Ministry of Industry and Trade of the RK, aiming coordination of the negotiation process of Kazakhstan’s WTO accession. In 2004 Nurlan became CEO for the Center of Marketing and Analytical Research. In 2007 Nurlan Kussainov became a CEO for CNRG Capital, and in 2009 he was invited to be managing partner of Al Falah Partners, managing a joint UAE and Kazakhstan private fund of 500 mln. USD to target CIS market. In 2010 Mr. Kussainov was appointed as the first deputy CEO, then CEO for the Development Bank of Kazakhstan. In order to Presidential Decree in January 2014, Nurlan Kussainov was assigned as a Deputy governor for the National Bank of Kazakhstan. In order to Financial Ministry's Decree in January 2016 Nurlan Kussainov was assigned as a Member of the BoD of Astana International Financial Center Authority. Later in February 2016, with the decision of the BoD, Nurlan Kussainov was appointed as the CEO for AIFC. AIX as a platform for attracting investment for mining companies.